Google Adsense Approval Case Study; how my Adsense account was Approved? Google Adsense is the best ad-network providing excellent revenues to millions of ads’ publishers. Just because of its high payouts bloggers love to place adsense’s unit on their blogs. But Google Adsense doesn’t allow everyone to become a publisher and only selected bloggers, after passing the hard approval process get their Adsense account. When I surf bloggers’ communities on social media sites, I normally find bloggers saying that “How I can get a fully approved Adsense account?”. The scammers target these bloggers and sale them fake ads accounts by saying that those accounts are fully approved. But here’s my story about approval of a real Adsense account. 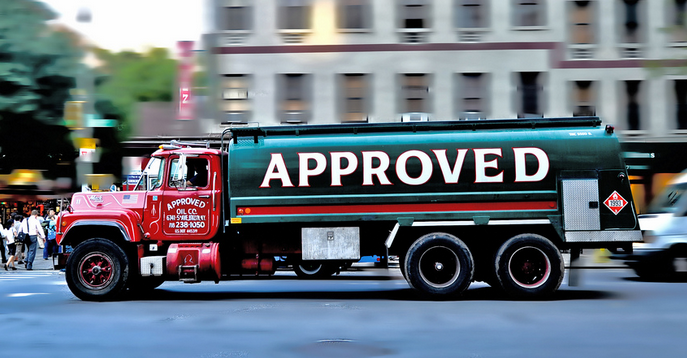 You can also follow my method for genuine Adsense account’s approval. Totally unique with minimum 400 words per article. Number of articles are more than 300. Every article consists of images and proper text. Proper credits are given to images and content under copyright act. Not a single word is copied. I know it’s strange that why i am discussing about keywords included in a blog. According to me Google Adsense’s approval system is automated process to some extent and it automatically rejects applications for blogs having illegal keywords. 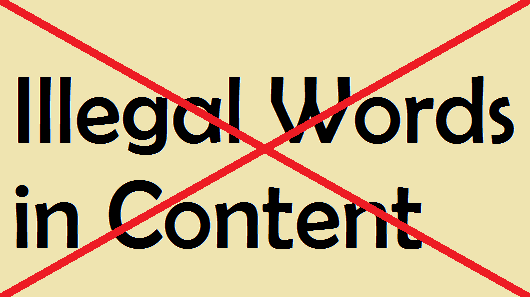 Here is a rough idea about illegal content and keywords. The first thing is patience, if you are impatient then it will be difficult for you to face failure. I didn’t applied for Adsense just after creation of my blog, I published more than 300 articles and after that applied for Adsense account. I provided the correct information about myself during completion process of Adsense application. Correct information is essential in creation of Adsense account because if you aren’t doing this, you may face trouble in future. In the first review process, Google provides you with a partially approved Adsense account and you are required to place ad units in your blog; only blank ads will be shown on your blog in this first review. What I did in First Review? I placed Adsense’s most loved ad units in my blog in the first review. I placed 336×280 ad units on the single posts pages (One ad unit above the fold and one below the fold), also used 160×600 banners in the sidebar; furthermore 728×90 size’s ad unit on other pages including categories and tags. Hurray! 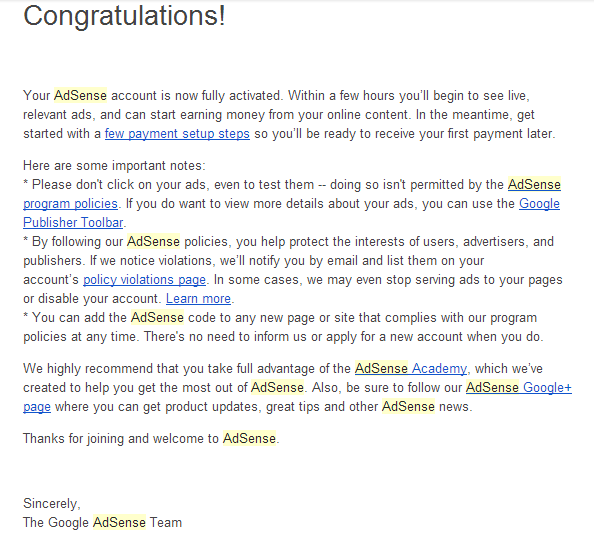 I got the approval email from Adsense team. Below image shows the approval email. I wasn’t expecting this approval because I was rejected two times before this. Previously there were some articles with illegal keywords and some spun content, i removed all those articles and applied after 2 weeks and it got approval; that means Google Adsense also respects quality just like Google search. Avoid fake ads clicks or fake impression on your blog. Avoid copyright or illegal content on your blog. Frequently update your blog with high quality content. Don’t allow other blog’s to show your Adsense ads. To do this go to: Settings> Access and Authorization> Site management. Without hard work and patience you can’t get approved for an original Adsense account. In my opinion you should create a blog with simple navigation, unique sufficient content, excellent design and high number of visitors. If you have a good blog and facing problem in adsense approval, you can share your problem with me via commenting on this article.